Cebu Food Crawl: Something to make us salivate for the rest of the holidays. We have so many exciting restaurants and food-finds to share with you during the 3rd edition of this Cebu Food Crawl. For Day 1, we had three gastronomic journeys to start with. Each has its own flavor flare, palatable style, and distinctiveness. We had a tummy-filled experience with these mouth-watering dishes as we took time to taste and savor all that we could. Over-all Place: Very spacious with ample of seats to accommodate patrons. High ceiling. We arrived around lunch time. Just a perfect timing for some hot soups that the restaurant is known for as we thought so. And yes, we were right. Located at the very heart of Cebu city's capitol area. Definitely easy to spot for first timers. The restaurant can be described as a hybrid of that of a fast food chain and a typical karenderia. And so they can be dubbed as an "Urbanderia". I definitely enjoyed a variety of their dishes from soups to grilled sets of seafoods, chicken and pork. I highly recommend you to try their Grilled Tuna Panga, their Linarang na Tangigue and Crispy Tuna Buntot (all photos below). The Grilled Pompano is also not to be forgotten. I can taste the freshness of the fish. Of course, their menu will not disappoint you if you prefer chicken or pork. They all got it for you to eat. BTW, Stan's Tinolahan + Grill also caters to nearby deliveries. Their target market would be the nearby hospitals, universities and residents surrounding the area. I can definitely vouch for the cleanliness of the place. They also have ample parking spaces and their pricing is reasonable for that matter, it means, affordable. 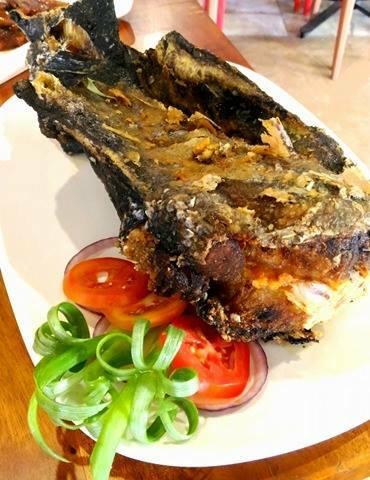 Just to further let you know, if you are from Manila, Stan's Tinolahan + Grill will open a branch there offering the best of Cebu's cuisine especially the Larang, Tinola, Pochero, Grilled Tuna Panga and Crispy Buntot ng Tuna. Arlei Travel and Tours will be our official transportation partner for this edition. They have available vans, coasters and private cars if you wish to have a tour here in CEBU! This festival whose name is Cebu Food Crawl looks heaven for a foodie like me.I really want to experience this food festival to enjoy all these tempting dishes. Blog Post is very helpful , thanks to share this valuable information.